I love Bluebird and Blackberries because the ladies are always pushing me to do things cheaper, better, and faster. I have to be really thoughtful with my recipes and in the end, though it can be challenging, it’s resulted in the creation of some of my favorite dishes—the ones I keep making week after week. My family tends to have mac and cheese at holidays and big gatherings. For Thanksgiving, though, I always want to make everything just a little special. But can you make a “special” mac and cheese in 20 minutes?! I found out you can! By putting a lot of thought into each of my ingredients, I only needed to use six of them to make a mac and cheese worthy of a dinner party! Step One was to create a simple white sauce to melt my cheese into—just butter, flour, and milk. And then, instead of using seven different cheeses (all of which must be shredded by hand) like I normally do, I used an Italian blend of pre-shredded cheese. I added cooked pasta, sundried tomatoes, and feta to the sauce and let it all come together in one big cheesy bath. The tomatoes were intense little flavor bombs that really balanced the creaminess of the sauce. And the feta chunks gave some tang to the dish and offered little surprises in each bite. 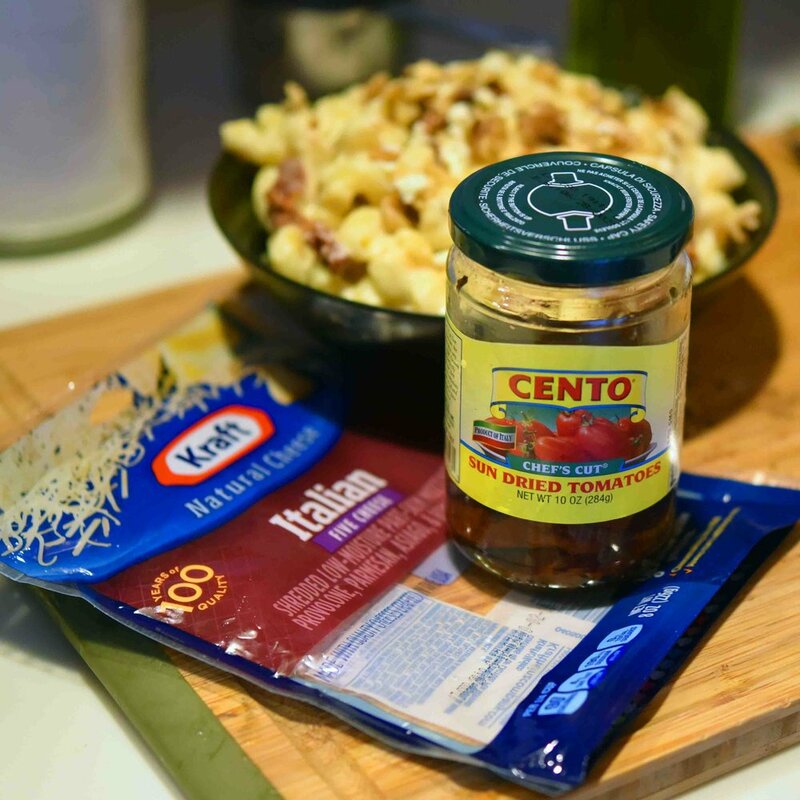 In the end, the key ingredients were Kraft Italian Five Cheese Blend and Cento Sun Dried Tomatoes (pictured below). I’m pointing out the brands because when you are using shortcut ingredients, you really need to get just the right ones to make it work. I topped the mac with some chopped walnuts because, well, it made it look fancier. And because I believe a mac should always have some sort of crunch on top. The end-product was so addicting that I couldn’t help but eat it right from the fridge. I was honestly shocked that I could simplify a mac to six ingredients and 20 minutes and have it truly feel fancy. So thanks, Terra, for the challenge. Now all of us get to reap the tasty benefits! Place a large pot of salted water over high heat for cooking the cavatappi. Heat the milk in a small saucepan just to a simmer, then set aside. Melt the butter in a large saucepan over medium heat, then slowly add the flour 1 to 2 tablespoons at a time, whisking until each portion is fully incorporated before adding more. Cook this mixture until it is thick and just beginning to brown—3 minutes. Then slowly add the milk to the butter mixture, whisking constantly until the sauce is smooth and thick—about 2 to 3 minutes more. When the water boils, add the cavatappi and cook according to the package directions. When done, drain and set aside. Add the Italian-blend cheese and salt to the sauce, stirring to melt the cheese, then turn off the heat. Fold the pasta into the sauce, along with the feta and sundried tomatoes, and toss these ingredients to coat. To serve, divide among serving dishes and top with the chopped walnuts.